Whether you’re behind the wheel of a Mazda CX-9, CX-5, or CX-3, you’re at a huge advantage when it comes to winter driving. 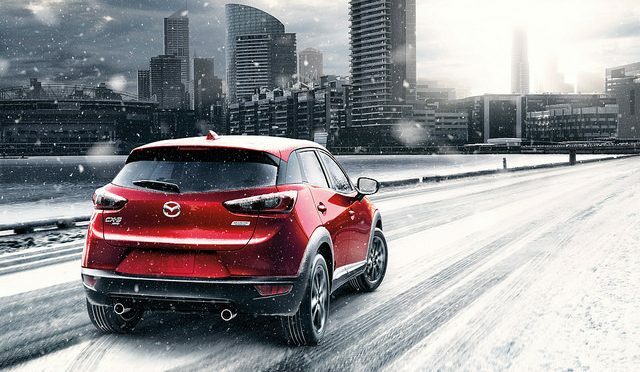 With superior performance and safety features, your Mazda SUV is well equipped to handle difficult cold weather conditions. Even so, it’s important to take these precautions to prepare your Mazda for cold weather driving. Colder weather means more salt and snow on the roads. These can corrode your vehicle’s exterior so be sure to put on a coat of wax before winter hits and cover your car to protect it from the elements. Cold weather puts additional strain on your battery. As temperatures drop, make sure your battery is fully charged. And if it is excessively corroded, replacing it now could save you from being stranded in the cold. Crossovers and SUV are engineered to perform well in less than ideal conditions, but without proper maintenance, your car may not be able to hold up properly under tough conditions. Make sure tires are properly aligned and inflated before you hit the road in the ice or snow. Be sure to keep emergency items such as blankets, a flashlight, an extra gas tank, and water in your car as winter approaches. A little preparation now will go a long way in the case of an emergency. Follow these simple tips and don’t let winter keep you from driving safely this year. And to find the perfect vehicle for any time of year, stop by Wantagh Mazda today!